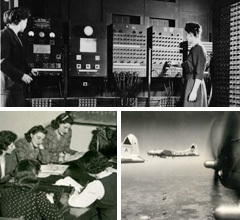 Top Secret Rosies | In war, math may be the most secret weapon of all. LeAnn Erickson is a Professor at Temple University in Philadelphia and has been an independent filmmaker for over 25 years. Her work has appeared on television, in galleries, and has won international recognition in video/film festivals. She is a recipient of regional and national production grants for her work from such funding sources as the National Endowment for the Arts, the Jerome Foundation and the Leeway Foundation.